On Sale! Save $6200 on this one, we've marked it down from $19988. Whoever says midsize sedans are boring hasn't met this Nissan Altima. It perfectly blends style, comfort, and agility in one irresistible package. This 2015 Nissan Altima is for sale today in Mission. Accelerate your pulse with a captivating look. Turn heads with sleek, flowing lines. Take on the road with exceptional efficiency, and gain confidence through innovative safety technologies. Inside, you'll find all the comforts you could ever want, but more important, the one thing you really need. A true sense of connection to what's possible. The 2015 Nissan Altima. It's time your ride kept up with your expectations. This sedan has 55971 kms. It's grey in colour. It has an automatic transmission and is powered by a 182HP 2.5L 4 Cylinder Engine. This vehicle has been upgraded with the following features: Bluetooth, Air Conditioning, Steering Wheel Audio Control, Fog Lights, Cruise Control. It has some remaining factory warranty for added peace of mind. Our Altima's trim level is 2.5. 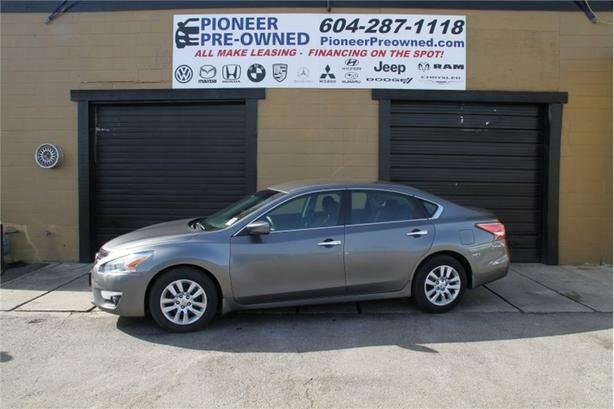 This Nissan Altima is an outstanding value. It comes packed with desirable features like Bluetooth hands-free phone system and streaming audio, steering wheel-mounted audio control, cruise control, air conditioning, remote keyless entry with push-button start, dual chrome exhaust finishers, fog lights, and more.